WAV Cutter Joiner is a powerful and ease-to-use WAV editor. WAV Cutter Joiner contains WAV cutter and WAV joiner in one program that can cut any segment of a large WAV file to separate WAV files. As a WAV jointer you can join multiple files into one big file or join any segment of the WAV files into one file. You can also adjust the order of WAV clips before joining. WAV Cutter Joiner can cut/join with high precision and no quality is lost. WAV Cutter Joiner is a powerful and ease-to-use WAV editor. 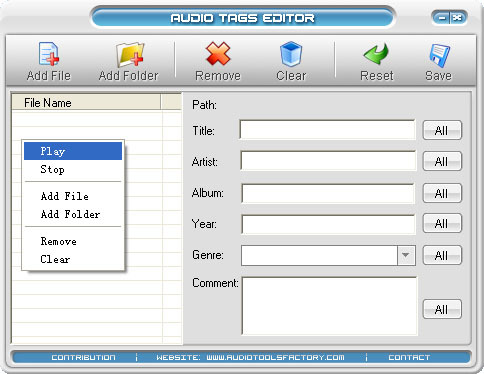 Fast MP3 Cutter Joiner cuts, trims and joins MP3 files fast. Qweas is providing links to WAV Cutter Joiner 1.00 as a courtesy, and makes no representations regarding WAV Cutter Joiner or any other applications or any information related thereto. Any questions, complaints or claims regarding this application WAV Cutter Joiner 1.00 must be directed to the appropriate software vendor. You may click the publisher link of WAV Cutter Joiner on the top of this page to get more details about the vendor.